I’m thinking instead of a FSR to use a push-button, as it will represent a savings of over $5 per plush object (remember, this project’s intended goal is to serve as electronics teaching to high-school at-risk students. So price is an important design factor). FSR ; Pushbuttons $0.95 or maybe these cute pink ones from Sparfun! Trying to decide what is easier: conductive thread or conductive tape? Will also need “snappy thingies” (they’re called sew-on snaps) to connect the soldered wire ends to sewing points (have no idea how many would be necessary). Cost: $19.95, 1” x 25’ which I think it’s plenty since the 1” width yelds four 1/4” strips of tape that are what the circuit connections requires. Why this seems like a better option to me: the circuit is easier to build, no soldering required, and it’s easy to undo if changes to the circuit occur (which are likely). 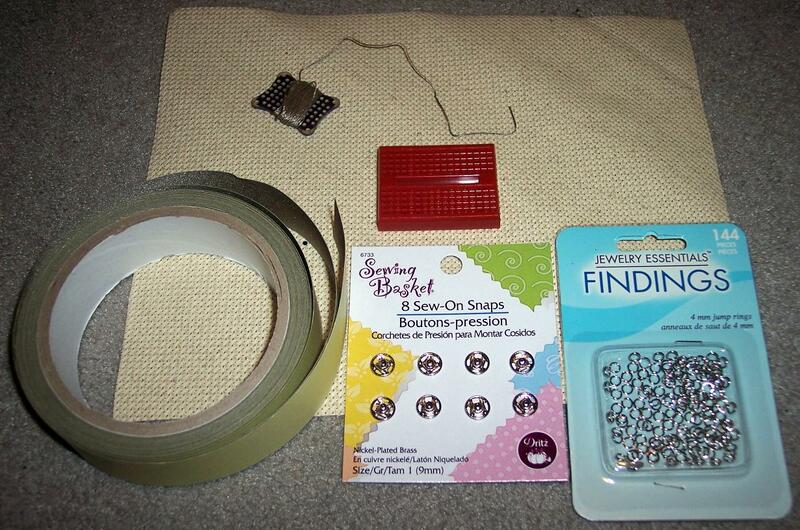 Pictured above are the cross-stitching fabric (whose hole spacing diagonally is perfect to fit the Arduino socket, or I may just use the mini breadboard), along with the roll of conductive fabric, conductive thread and the sew-on snap fasteners. Which direction do you think I should go? The easier tape route, the sewing route, or something else altogether? Interesting project! Force sensors can be very inexpensive, especially if you make your own. You know how some IC chips come with a little piece of black foam on the bottom? Strip a couple of wires and push them into the foam, then cover with tape to hold everything together. Now you have a variable resistor force sensor! I made one yesterday and it works great. The resistance is 3K and goes down (fairly linearly) to around 1K when pressed hard. 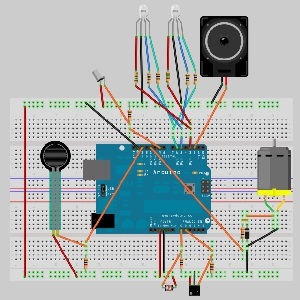 If you want, I can send you a video of my $0.00 force sensor controlling an LED bar graph. That’s great to know! Thanks Tom! Hi Natalia, I have just discovered your site via twitter and love your project! I am looking forward to see the next steps. Nice project! You could always just run two wires really close to the nose on the inside and use a capacitive touch type switch, that way no pressure is required just being near it. You can calibrate sensitivity in code. Android has the CapTouch library, but I’m a big TI fan and some of their chips with capacitive touch built-in are really cheap! They also recently came out with a WiFi chip that’s cheap https://tinyurl.com/ahmxcmo .. in case you wanted to add your Plushy’s to the Internet of things!